C++ Programming in easy steps instructs you how to program in the powerful C++ language, giving complete examples that illustrate each aspect with full colour screenshots and colourised code. 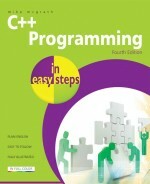 Now, in its fourth edition, C++ Programming in easy steps begins by explaining how to download and install a free C++ compiler so you can quickly begin to create your own executable programs by copying the book's examples. It demonstrates all the C++ language basics before moving on to provide examples of Object Oriented Programming. The book concludes by demonstrating how you can use your acquired knowledge to create programs graphically in the free Microsoft Visual C++ Express Integrated Development Environment (IDE). C++ Programming in easy steps has an easy-to-follow style that will appeal to anyone who wants to begin programming in C++. It will appeal to programmers moving from another programming language, and to the student who is studying C++ programming at school or college, and to those seeking a career in computing who need a fundamental understanding of object oriented programming. "This book is amazing. The wording is easy, fast, and to the point. You can devour a chapter in less than ten minutes and have PLENTY of time to fool around with what you've learned after! This book told me in two pages how to write to and from a file where seven pages in my smaller-texted, bulky, wordy but yet five-starred textbook could not." "An excellent, well designed book that gives any person who is getting started with programming in C++ a comprehensive overview of how to program in easy steps." "A C++ book in color!!! Very easy to navigate through, as everything is concise in just two pages. Easy to follow and a good book to reference back to. 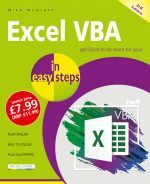 ...this book is the best and recommended for the absolute beginner. " Learn C++ Programming basics for free!